Idiot-proof airplane – ¿¡ tjongolongo ?! An airline has decorated one of its planes as an idiot’s guide to aviation. It’s written on the plane where the captain is located and where the front door is etc. Not only have they labeled all things, they even included some funny remarks. They even have directions to the toilet saying ‘mile-high initiation chamber’. Tjongolongo, how funny would it be to see this plane in real life! 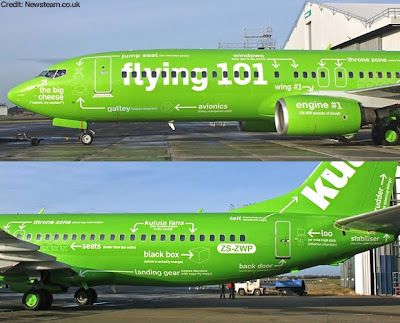 The plane is of Kululu Airlines and its unique branding is part of their strategy to demystify air travel of their fans according to their marketing manager Nadine Damen. I think this airplane is hilarious and I’m quite interested to know what it’ll look like on the inside. If they have managed to take this ‘Flying 101’ theme indoors as well I definitely want to see it for myself! What would you like to see labeled on this plane? Let's go to South- Africa! I'm also curious how this plane looks like from the inside!